Quick update on our raid progression, since I’ve been lax about updating on it: the hunter became the hunted, and Shannox went down… And earlier this evening, we got Beth down ^_^. This was, of course, after my healer yelled, “Stop plundering the Beth’s hole!” many, many times. But that’s besides the point! We had fun, and that’s what mattered. On a side note, we did a BoT run afterwards, that consisted of three PUGs, a guildie who hadn’t done the raid at all, and a guildie tank who’d DPSed all the bosses but only tanked up until the Ascendant Council. In the end, we cleared the place with no wipes ^_^. Sure, we had a death or two, but I was VERY proud of my folks for clearing everything as cleanly as they did. You are SO on my wall. My healer said Beth died from my spelunking in her hole. She’s not wrong. After having fun pulling together a raid again (/sigh), myself, my fellow Far Riders, and our one PUG flew ourselves over to Bastion and proceeded to have some good ol’ fashioned trash wipes. Ahaha. Despite the initial difficulties, we fought our way over to Halfus and found we had the Slate, Nether, and Storm drakes this week. Initially it was suggested to release Slate and Nether, with our DK tank (Angimar) on the drakes and myself on Halfus, but that wasn’t working well for us. Per a guildie’s suggestion, I tried kiting Halfus to drop the healing debuff, but this quickly proved ineffective. We finally worked out that we should be releasing Nether and Storm instead, and I flip-flopped with our DK, since my main mitigation is blocks which allow the debuff to continue to stack. Within an attempt or two, we had Halfus down, loot was distributed, and we proceeded onwards. During Valiona’s ground phase, I tanked Valiona, and the four melee stood at the four corners of her massive hit box, leaving 10yd range all around. The ranged and healers stayed nearby, and for Blackout, everyone except myself ran to the tail of the dragon. Naturally, we got out of harm’s way when Devouring Flames was being cast. When Theralion was on the ground, I again tanked with melee stacking on me and the ranged/healers forming their own clique (heh ^_^’) behind the dragon. This resulted in almost all (if not all) void zones being cast on the ranged group, who simply moved in a clockwise circle around the boss, leaving the melee and myself to wail upon the dragon. When Valiona came charging through with her deep breaths, we moved as a group to dodge. Eventually, the Twins went down, more loot was distributed, and we decided to head over to BWD and put in some time on Magmaw. After the trash was cleared, Ang went frost again, and using his specially setup spec (Chilblains + Glyph of Howling Blast, I believe), he kited the parasites that spawn during the fight. For positioning, I was on one side of Magmaw’s spike, and everyone else was piled in on the other side, with Ang running around with his parasite buddies. After having initial difficulties with dying at the end of Magmaw’s Mangle, I realized that it’s possible to use Ardent Defender or Guardian of Ancient Kings so that the length of the ability would fall over the end of Mangle, thus saving myself from a chewy end. The beauty of it though, was that whichever ability you used for the first Mangle would be up in time for the third one, so either ability was always up in time for the next Mangle. Unfortunately, the PUG healer we had with us for Halfus and the Twins was going to be doing a guild run of BWD the following night, so he was unable to come with us. 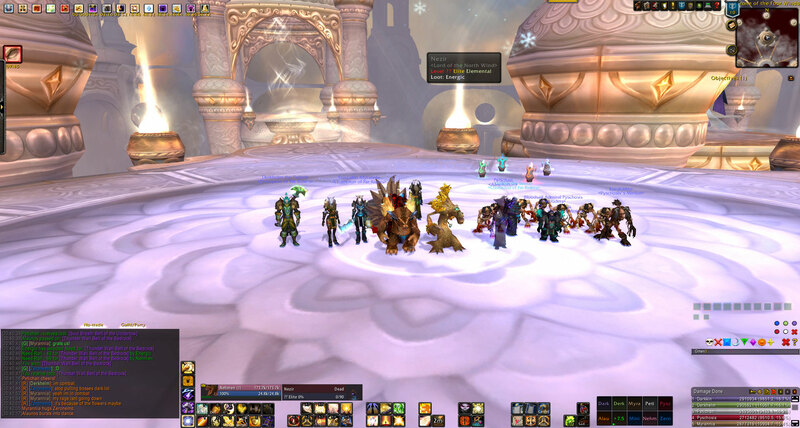 One of our melee DPS switched toons to his Disc Priest to cover the healing slack, but no one else was available at the time, and since we were so close to the end of our raid time, we decided to simply 9man the fight. As it turns out, we ALMOST got Magmaw down (I believe the last wipe was somewhere around 6% health remaining? ), but during our last run, our warlock’s computer decided to shutdown (a proper, full sequence shutdown too – not a “I just lost power,” instant shutdown), so we hit the enrage timer before we could finish the fight. Despite being unable to kill the accursed worm tonight, I know that if we could’ve nearly 9man’d Magmaw (with a dps absent for 2/3 of the fight), then we can definitely down him on our next raid night with 10 raiders. I’ll continue to keep you posted on Far Riders 10man progression, so stay tuned! Also, if you noticed that we could’ve used a different tactic to make a fight easier, then please leave a comment telling me how. I’ll be sure to keep any suggestions in mind! This isn’t an “experiment” /failcheck – this is me calling out a clear “fail” that needs to be addressed. Here’s the short version of this post: have realistic expectations of a PUG and address issues when they arise instead of saying nothing. Here’s the long version: I was talking to a friend of mine in my guild, and she mentioned that one of our fellow officers was constantly posting messages in officer chat along the lines of “these guys are total fails,” I wish they would do their job right,” or “can I cry now because this is so horrible.” (I’m not exaggerating about the “can I cry” part either – he says that a lot). Now, I haven’t been on when this occurred; otherwise, I’d tell him to do something about it or stop talking about it. Annoyed guildmates is the only result you’ll get from moaning and groaning in guild/officer chat about something you can fix. We are only 8 days into the new expansion, so most of the PUGs you’ll get via heroic queueing (and even regular queueing) are players who haven’t done that dungeon/version of that dungeon yet. Newness of the expansion aside, I was still running into players new to a particular PUG during the final month of WotLK. You will always have the chance of that happening when queuing for a PUG, so get used to it or stop queuing. If nothing else, remember that at some point during your WoW lifespan, you were likely in a similar situation. Would you have appreciated other players being mad at you for not knowing a fight on your first visit to a dungeon? There are millions of resources on the internet that can prepare you as much as possible for a fight before doing it, but WoW is first and foremost a game. I feel I can safely say that Blizzard has never and will never release a game designed to force you to research encounters before doing them. There will inevitably be trial-and-error wipes, but that’s how games have been for a long time (“how do we kill Bowser on this level? Well, let’s try this…”). Gear is a prerequisite in my eyes. If it wasn’t, then Blizzard wouldn’t have set a minimum iLevel for players to meet before having access to the heroic dungeon queue. There are some WoW players who don’t put much/any effort into gearing up for heroics, and it tends to ruin the fun for your fellow PUGers when you’re one of these people. After all, it’s one thing to wipe because you don’t quite know and encounter yet. It’s another thing entirely to wipe because your gear is so insufficient that it’s impossible for you to best an encounter (e.g., a tank wearing WotLK blues/purples is likely going to be unable to successfully tank a Cata heroic). This is what the minimum iLevel is supposed to prevent, but some players are finding ways to cheat the system. One example that I’ve seen is a warrior equipping an intellect/spirit blue ring they got form a quest, simply because it puts them above the iLevel bar. Knowing your class is highly important, and a key feature of the game. Although there’s been some homogenization of class abilities lately, all classes have there own, unique abilities that makes them different than other classes (otherwise, why have classes at all?). You should know what these are, when/how to use them, and why it’s important to do so! Finally, if you’re in a PUG where someone is failing at something important, then do something constructive about it. As I said before, complaining to your guildmates about a problem you can solve is of no benefit to yourself. Tell your party why what’s happening is wrong and how to correct it. If you can at least do that, and they refuse to listen, then I’m willing to hear your monologue about how you’re in the worst PUG ever. If they try to do the correct method and aren’t quite getting the hang of it, then I’m just going to say “luck of the draw” and tune you out. I stand firmly beside my belief that games should be fun. If other people are ruining your fun intentionally by being stubborn headed about doing things the wrong way, then I sympathize with you. However, if they’re giving their best effort, and you still complain to me about it, then you’re ruining my fun. And that’s no fun (bah dum tsssh?)! Heroic Stonecore, how I hate thee. I’ve successfully completed two heroic Cata dungeons as a tank, and yet I can’t get past Corborus on heroic mode SC. Yesterday evening, my guild’s raid leader invited me to tank for a heroic group he was forming, and I accepted, hoping to have some challenging, but fun attempts at downing a heroic dungeon. After everyone joined the party, I suggested that we do a random heroic, since I hadn’t done my daily random. The group agreed, we queued up, and into heroic SC we went. … And not much further than that. We cleared Millhouse and his buddies without any real issues, and upon reaching the bottom of the first passage, we were ready to kill some gyreworm. After pulling, we quickly realized that something was amiss, and instead of gyreworm being on the menu, we were on its menu. While reseting, we reviewed the strat, covering the new heroic abilities, and confident that we had the right idea, we charged in a second time. 24+ attempts later, I finally had to tell the group I needed to leave; I had to go to work, and we had yet to get the bloody worm below 600k HP. After returning from work, I logged on because I still wanted to get in a successful random heroic. One insta-tank queue later, I found myself in… Oh, bloody hell – heroic SC. I expressed my frustration to the party, who reassured me with comments that generally amounted to “we’ve got this – it’s easy when you know the fight.” Now, call me crazy, but when someone makes a comment along those lines, it says to me that they’ve completed the fight before. So, reassured that I was likely with a better group, I reviewed how I was tanking the fight with them, and besides one small adjustment they suggested, I found I was ready to go. We breezed through Millhouse’s folks, and quickly found myself face-to-face with the dreaded worm, once more. To skip some unnecessary story, I soon found myself recovering from our fourth wipe. Now, to be fair, I normally stick with groups for longer than that, but considering this was nearly my 30th wipe of the day on this horrible fiend, I gave the group my apologies and left the party. I went on to queue again, and thankfully, I found myself being loaded into heroic Throne of the Tides. The trash in here is, without a doubt, extremely difficult – even with CC – but after a couple of painful attempts and wipes, we made our way to Neptulon’s throne to take down Lady Vaz’jar. After some more painful attempts and wipes, working out exactly who needed to CC what and reminding everyone to dodge the tornadoes o’ doom, we got her down. Yes! First heroic boss of the day down! 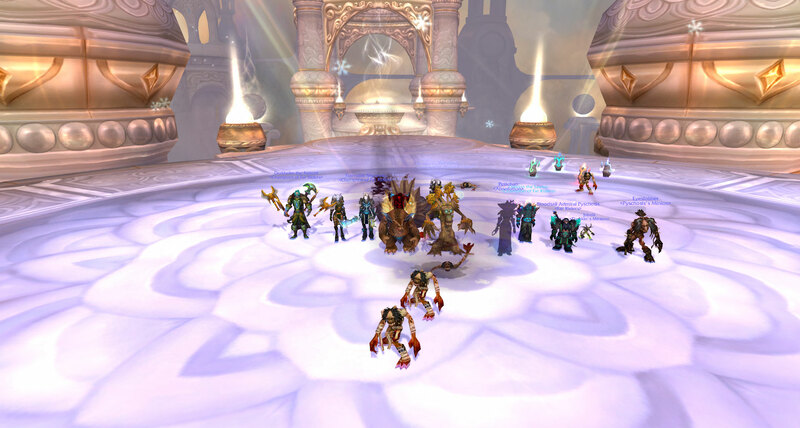 And to make the victory sweeter, the tanking ring Entwined Nereis, dropped! /roll… And here’s my… Huh? The kitty dps won? Immediately, our healer scolded the bad kitty (heh; had to say it) and told them to give me the ring, saying, “If you want tank gear, then queue as a tank!” The druid made a half-formed comment along the lines of “I need it too,” then left. Yes, remember the title of this blog post? A lament generally contains few happy moments – lol. After requeueing, we acquired a warrior and went on to down the rest of the dungeon. 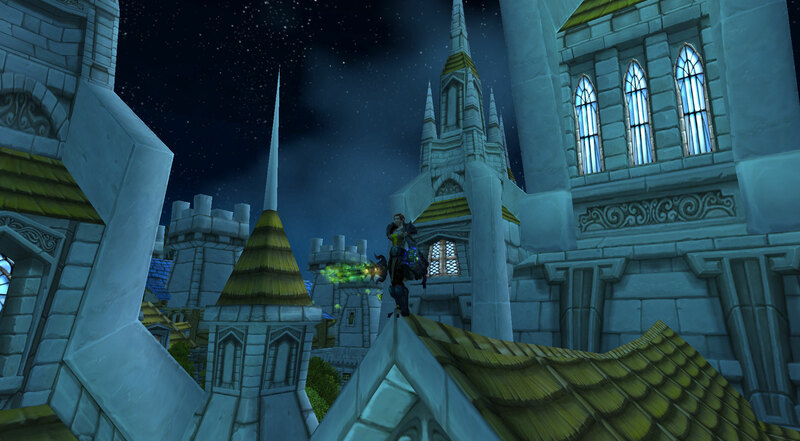 Several folks got some spiffy gear, and I got my heroic done, but I was left feeling slightly empty inside. That PUG reminded me of why I typically run with guildies… I can trust them (for the most part) to not pull shenanigans like that. Ah well – live and learn, I s’pose. Have any stories about the new cata dungeons? Feel free to share them below! One of the alts I’m currently leveling is named Nehmend, and she is a holy paladin that I’m leveling (currently level 37) almost exclusively through PUGs. Yesterday, I queued up and swiftly found myself entering the soon to be corpse-filled halls of the Scarlet Monastery’s library. Nothing seemed out of the ordinary from a quick glance at my Grid addon – I saw a druid, shaman, priest, rogue, and myself; we had all the workings for a successful collaboration of a tank, healer, and three dps. So, I rebuffed myself with Seal of Insight, gave everyone Kings (paladins don’t receive Might until level 56 now), and followed my fellow PUGers as they charged into battle. Right away, I could tell something was wrong. The party was taking very large amounts of damage (not a problem, considering pally heals are OP at this level, in my opinion), and I saw… A boomie? Begrudgingly, I did just that; I shut up and continued to fill them with plenty of Holy Shocks and Holy Lights. As the dungeon wore on, I found that our party makeup was working after all, but something was still nagging at me – something was still wrong that I couldn’t quite place. After tearing through half of the dungeon, leaving mayhem in our wake, I realized the issue: if I, the healer, wasn’t effective, then they likely would have kicked me… and it probably would’ve worked. I say this because the druid and priest were clearly together on their shenanigans (as evidenced by their support of the idea and their shared server/guild name), and if people were dying from no heals, then a “Kick Nehmend?” prompt probably would be answered with a “yes” by at least one of the remaining dps. Now, it wasn’t the threat of losing my spot in the party that bugged me (I was confident in my healing ability, after all), but rather the question of “what if a lesser experienced healer where in my place?” Most WoW players, myself included at times, forget that we may be playing with someone new to their class, to their party role, or even to the game itself. With that party, I realized that a new player to WoW likely would have been kicked from the party and likely without an explanation. That’s not fun for anyone and would highly discourage new players of the game. After all of this hitting me an instant, I knew what I had to do: I needed to attempt to send a message to this boomkin by getting THEM removed from party for doing the job the queued for improperly. I had already tried convincing them the normal way, so I knew that would not work, and I wasn’t about to launch into a discussion about inexperienced players (both because they probably wouldn’t have listened/cared and because that would have resulted in our deaths, since they were chain pulling everything), so I was left with only that option. Unfortunately, I was unable to get a vote to even occur due to their chain pulls (you can’t initiate a vote during or shortly after combat, for those who haven’t used this PUG feature before). I did make sure to /ignore them (the druid and priest), so I wouldn’t be partied with them again, but I’ve been left with disappointment that I was unable to do something about this duo of troublemakers. What do you think? I’m interested in hearing other players’ views on how to deal with situations like this.